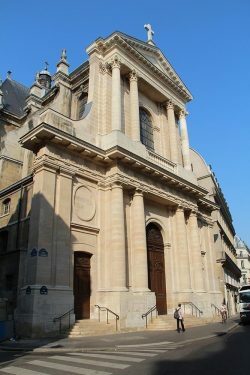 In Paris as in many other cities in France, former places of Catholic worship which had become national property at the Revolution, were turned over to Protestant worship. Lutheran Church, Billettes parish (75) © S.H.P.F. A former convent of the Carmelite Billettes – so called after a decoration on the monk’s habit – was built in 1290 on the site of a “miracle” (a Communion wafer stabbed by a Jew was said to have risen to the sky from this spot). 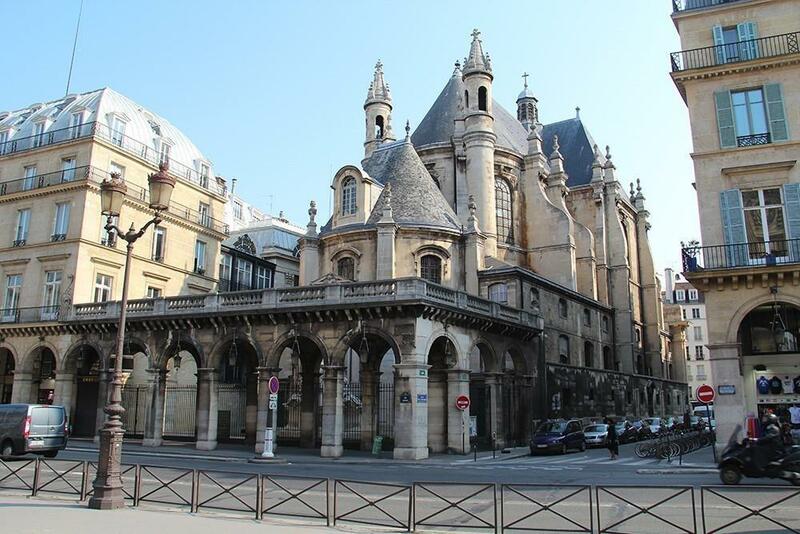 The cloister was built in the 15th century and is the only medieval one still standing in Paris. The church was rebuilt in 1756. The buildings were used to store salt during the Revolution. They were then given over to Lutheran worship in 1808, and renovated. The first service took place on 26 November 1809. An old convent, the Filles du Verbe Incarné were replaced there by Bernardine nuns called Clairettes. The latter came from Panthémont (Oise) to educate “distinguished” young ladies and to take care of elderly ladies. 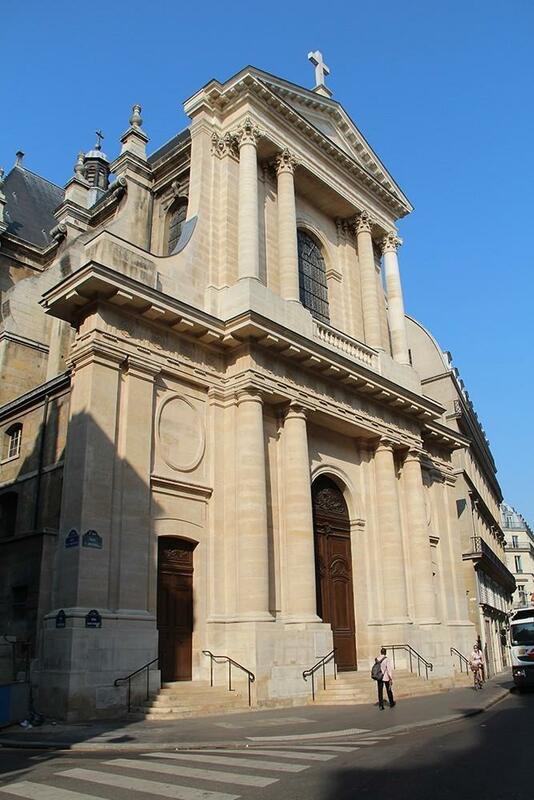 The chapel was built in 1747 by Pierre Contant (or Constant) d’Ivry (1698-1777). It was turned over to millet storage during the Revolution and then into a hay store for the army. After the Concordat it became a Temple annexe to the Oratoire (Oratory). From 1803 it was given to the Paris Reformed Consistory, but was used only in 1846. After the Revocation, the Protestants in that area met in the chapels of the Dutch and Swedish embassies. In 1621 Father Bérulle formed the congregation of the Oratory and started construction of the Oratory chapel. The plans were drawn up by Jacques Lemercier (1585-1654). The foundation stone was laid on 22 September 1621. Louis XIII began a “Grand Design” and decided to extend a wing of the Louvre Palace towards the Rue Saint Honoré, thus the chapel had to be built obliquely on the rue de l’Oratoire. In 1625 the work was interrupted for 10 years. In 1642 and 1643 the funerals of Cardinal Richelieu and King Louis XIII were held at the Oratoire, and in 1666 that of Queen Anne of Austria, which Mazarin attended. The nave was only completed in 1740, and the main entrance door panelled in 1745. In 1793 the church was ransacked and looted, and turned into a conference hall, study facilities and theatre scenery storage depot. In 1811 Napoleon 1st made the Oratoire available to the Reformed community. The interior was thoroughly redesigned for Protestant worship. 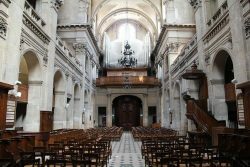 The wood-panels came from the former Saint-Louis du Louvre church, given over to Reformed worship from 1790 to 1811, and then demolished. The first pastor of the Oratoire Temple was Paul-Henri Masson (1754-1832) who had previously been chaplain to the Netherlands embassy. 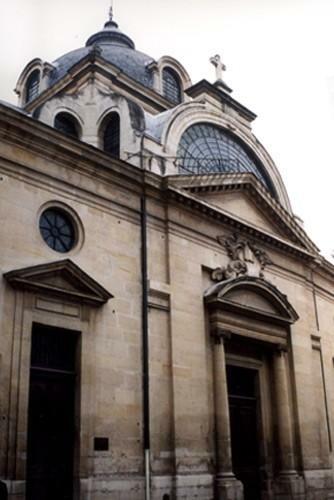 It is the largest Reformed Temple in Paris. The organ is outstanding. 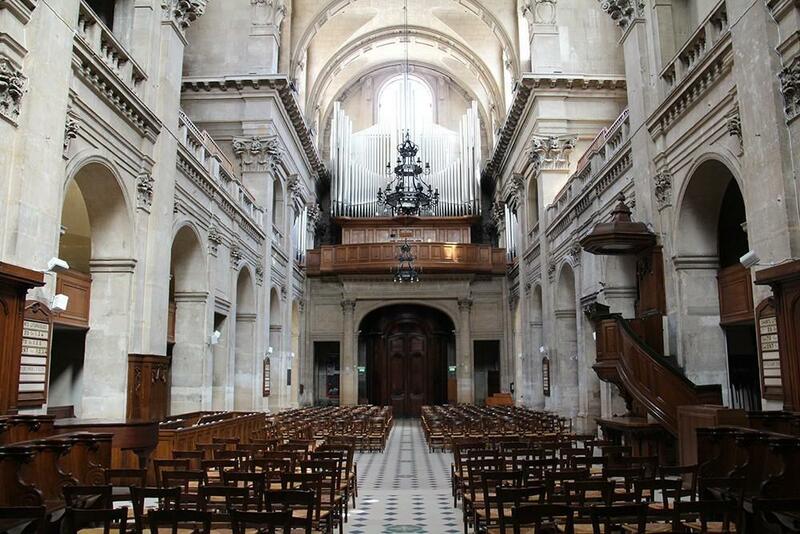 In 1899, on the rue de Rivoli, at the apse of the church, a monument to admiral Gaspard de Coligny was errected. The work was carried out by the architect Scellier de Gisors and the sculptor Crauck. 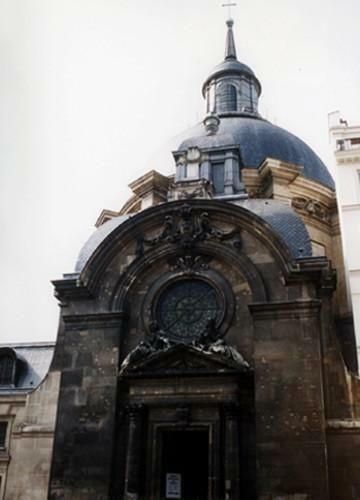 The chapel of the Visitandines or Daughters of the Visitation was built by François Mansart between 1632 and 1634. Saint Vincent-de-Paul was the spiritual leader of the convent for 28 years. In 1790 the convent and the chapel were emptied of their furniture when they became national property, and served as storage for books seized from immigrants’ homes. In 1792 the Visitandines had to leave their convent. 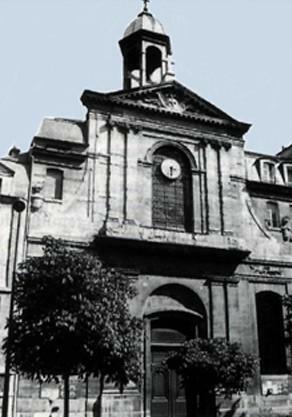 The association of the “Friends of the Law” and a revolutionary club led by Théroigne de Méricourt held meetings in the chapel. In 1796 the buildings were sold and demolished, except for the chapel. On 1 May 1803, Bonaparte gave it over to Protestant worship. Dating from the time of the Revolution a strange Phrygian style cap remains above one door. The arms of the Coulanges family, benefactors to the Visitandines, can still be seen in one chapel. There is a beautiful vaulted crypt in the basement. In 1830 the state funeral of Benjamin Constant, a friend of Mme de Staël, was held there. 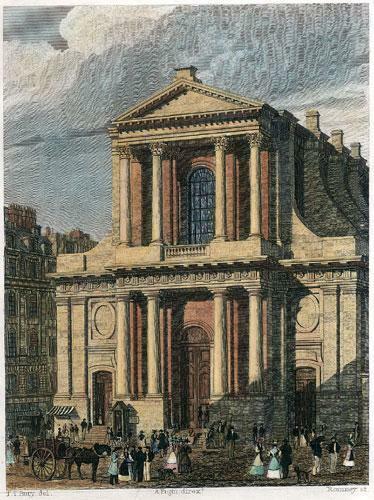 The Temple was formerly called Sainte-Marie. The former customs building, built by Lussau between 1821 and 1825 in the style of the architect Nicolas Ledoux (1736-1806), was devoted to Lutheran worship. The Billettes Temple was now too small, and worship was first held there on 25 June 1843. The Duchess of Orleans, Hélène de Mecklembourg, was a frequent attender, as was Baron Haussmann.